I haven’t noticed many butcher counters in San Diego selling the steak pre-shaved, but this is an easy, inexpensive technique to do at home. 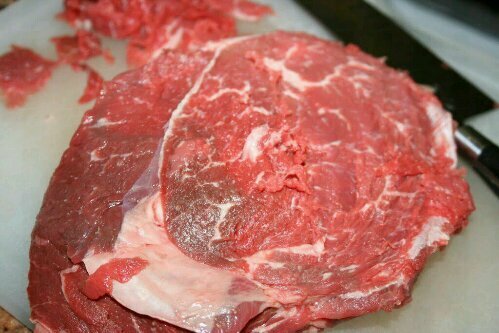 Simply purchase an inexpensive cut of beef, such as top or bottom round, and freeze it for an hour or two until it is very firm but not frozen solid. Using a sharp knife, make “handkerchief-thin” cuts (1/16- and 1/8-inch) across the grain. 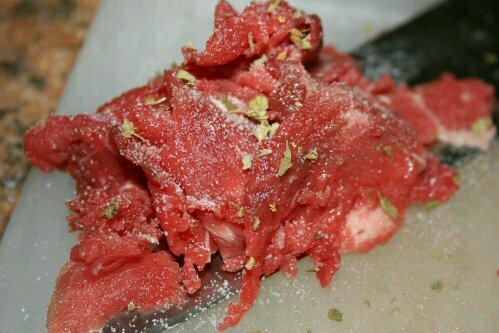 If the meat starts to get too soft to cut, simply return it to the freezer for 15 minutes, then continue making your cuts. The sliced meat can be used in the great recipes accompanying the article (Mexican-Style Pepper Steak, Glazed Beef-and-Scallion Rolls, Beef Involtini With Grape Tomato Sauce), beef in brodo (simply hot beef broth poured over raw shaved steak) or in any hearty soup to fight off the May Gray (or June Gloom). I threw together a Peruano Bean Soup with Steak and Cumin – a spicy vegetable soup redolent of cumin and chile, thick with beef, beans, and spice – sure to brighten any day and make you think of warmer weather! 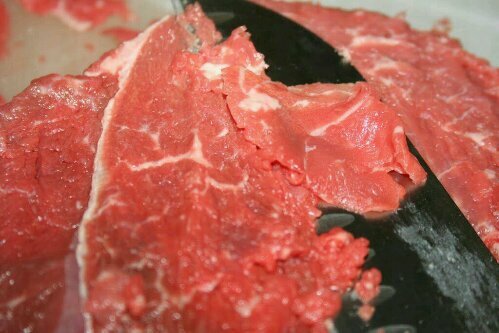 Hi Ish – They cut the meat pretty thin at Zion Market, you can even request it cut thinner if you want. They also have several grades of rib eye, 8-up and 10-up. Thanks for the tip, Kirk! I’m right in the area but never seem to make it in to Zion, so will have to make a point to stop there this week.